DISCONTINUED. 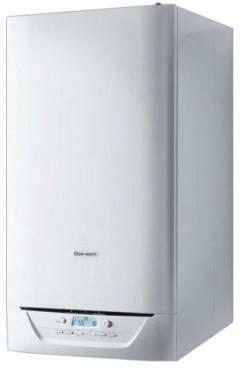 A combi which also has the benefits of a system boiler the Glow-Worm Ultracom 35 Store combi boiler offers domestic consumers the best of both worlds. It has a higher flow rate compared to a normal combi boiler and it suitable for larger households that use a lot of water. Featuring two 21-litre integrated storage tanks for hot water it provides unlimited hot water at the touch of a button. There's also a removable filter to protect the heating circuit even in areas with hard water. The boiler has a good range of controls which includes an on/off button reset button and a mode selector. The heating and hot water temperatures can also be adjusted and there is a digital display. However on this particular model of boiler the controls are exposed. Optional external controls can be fitted to enable the boiler to operate most efficiently. It's compatible with Glow-Worm's wireless programmable room thermostat the Climapro2 RF. At 89x47x57cm the boiler is considerably taller and deeper than the majority of combination boilers on the market. It's also heavier at 67kg. The Glow-Worm Ultracom 35 Store combi runs on natural gas although for homes off the gas grid it can be converted to run on LPG. Rated 89.4% for efficiency by SEDBUK it comes with a standard 2 year warranty for parts and labour. The Energy Savings Trust recommend this boiler.